FBN's Shibani Joshi on Apple's new iPhone campaign. In its old campaign, Apple (NASDAQ:AAPL) simply argued that the iPhone 5 was the biggest thing to happen since the iPhone. For weeks, the top image on the company&apos;s website was of the new iMac and the iPad mini, with the tab to reach its suite of iPhones positioned near the bottom of the page. In the face of growing competition and just days after Samsung released the Galaxy S 4, however, Apple has emerged with a much more aggressive iPhone campaign, hitting rivals with its list of customer satisfaction awards and exclusive features in a direct hit to the Japanese mobile device maker. 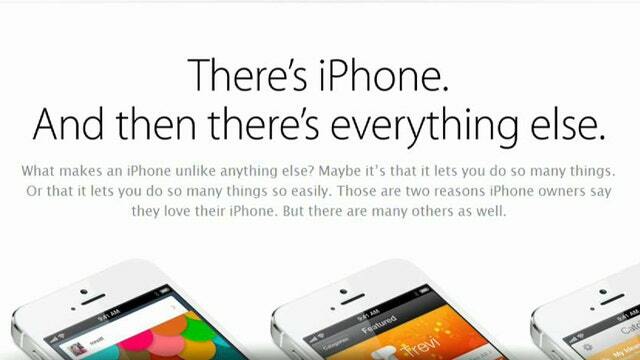 Even more, Apple has created an entire new web platform explaining why the iPhone is better than any other smartphone. Cupertino, Calif.-based Apple also offers several nods to its loyal customer base, including bragging about its eight straight J.D. Power and Associates awards for customer satisfaction. It then gets much more aggressive with the tone of its ad, touting the iPhone has the only Retina display and “the world’s most popular camera.” Its earlier campaign simply compared the iPhone 5 with its predecessor. The Galaxy has long been praised for its high-quality camera compared with the iPhone, and the Galaxy S 4 is its best yet. Apple, while previously saving just one line in its web campaign for the camera where it simply referred to it as an “8 MP iSight camera,” has now given the camera its own section. Apple provides data from Yahoo’s (NASDAQ:YHOO) flickr that shows the iPhone 4S, iPhone 4 and iPhone 5 as the world’s three most popular cameras and waves away the Galaxy’s 13-megapixel rear camera that allows users to use the front and rear camera simultaneously. “While other smartphones simply tout large amounts of megapixels, taking great pictures is about so much more,” Apple said. The new campaign comes as Apple struggles under the weight of heavy criticism regarding its ability to continue serving as the mobile device world’s greatest innovator and as its stock has fallen some 40% from all-time highs.